Place : Spread over Chitrakoot district of Utter Pradesh and Satna district of Madhya Pradesh. Chitrakut (Chitrakoot), the 'hill of many wonders' is a religious pilgrim center as well as a historical place. Spread over the states of Utter Pradesh and Madhya Pradesh, it's larger part is included in the Chitrakoot district of Uttar Pradesh and Satna district of Madhya Pradesh. Nestles amidst tranquil forest glades and mountain streams in the Vindhya ranges, thousands of pilgrims comes here for Hari darshan and pay their homage to the God Hari. It's ancient history dates back to the time of the Ramayana - Lord Rama, his brother Laxman and Sita, while on their fourteen years of exile, spent eleven years at Chitrakoot. The place is also the great Sage Atri and his wife Anusuya meditated, and the holy trinity of the Hindu pantheon Brahma, Vishnu and Shiva took their incarnations here. Situated on the banks of the river Mandakini, it is the most visited place in Chitrakoot. Like Varanasi, it is a long stretch of steps cut into the banks where pilgrims perform religious rituals on Amavasya, Somwati Amavasyas, Deepawali, Sharad-Poornima, Makar Sankranti and Ramanavami. Legend says that Lord Rama, his brother Laxman and Sita made Ramghat as their bathing place. It is here the famous saint poet Tulsidas wrote 'Ramcharitmanas'. 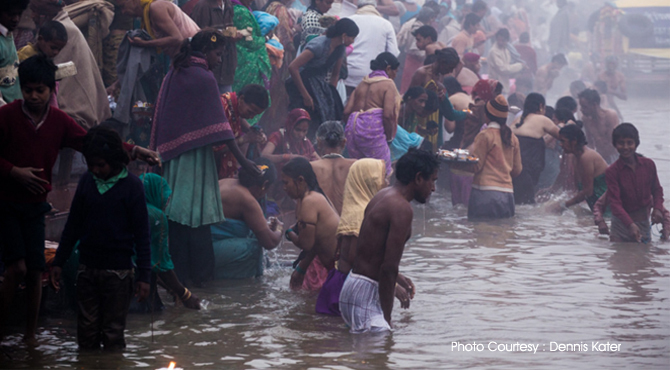 Here, amidst the chanting of hymns devotees in saffron robes take a ceremonial dip in the river and offer prayers early morning. A good way to see this ghat is to hire a boat. Just 2 km from Ramghat is Janaki Kund, where Sita is believed to have bathed. A series of steps on the left bank of a straight stretch of river, descending down to the river Mandaikini. Near to this, there is a cave shrine along a steep cliff that rises above the river, known as Sita Kund surrounded by mountains. The Godavari River flows underground of this cave, but no one knows where they disappear after entering the cave. Near to this is a havan bedi, where Sita used to perform havan (fire ritual) after taking bath. Believed that, the havan bedi was built by Sita herself. Local priests come here come here every morning and evening to recite Ramayana. There is a stone nearby bear the footprints of Sita. Beyond Janaki Kund, there is a densely forested area along the banks of the Mandakini. Known as Sphatik Shila, here also bears Lord Rama's footprints. To see this, one have to trek up on to a large rock. It is also believed that, here Sita was pecked at by Jayant (the son of Lord Indra), in the form of a crow. Said to be the first hut made by Lakshma for his brother Rama and Sita. It has been reconstructed as a temple and many devotees come here for worship. Situated on the backdrop of Kamdagiri Hills, here, Lord Rama’s younger brother, Bharat, stayed when he had come to Chitrakoot. Situated 5 km away from Ram Ghat, lies a shrine devoted to Hanuman. One have to climb 650 steps to reach this place. It is believed that Hanuman, after setting fire in Lanka, requested Ram to help douse the fire inside his body. Then Ram shot an arrow and a stream flow from the mountain. Since then, it is known to be as Hanuman Dhara. It is located just above Hanuman Dhara. It is a small room where Sita believed to cook food here. Situated 19 kms away south of Ram Ghat, is Gupt Godavari. It consists of two natural caves and one of these caves is perpetually fed by a small stream of water. At the entrance, there is a carved sculpture of the Trinity of Brahma, Vishnu and Shiva.